This card was tucked away into the notebook for future reference. We have an old wheelbarrow just like that, blue even, sitting in the garage with a chronic case of flat tire. Our wheelbarrow pushing days came to an abrupt end a few years ago with the over exertion of stone moving. Read about the big stones here-The Stone Purchase. A trip to the doctor revealed good news and bad news. The good news, no surgery needed. The bad news, no more heavy lifting. The trouble is, heavy lifting seems to be a part of life, especially if one gardens. The Financier helps when asked, but usually I am alone and wanting to move something heavy. Or pick up a grandchild who has arms extended upward lovingly. But we digress. The point being made is there was a wheelbarrow available to make into a planter. Onward. 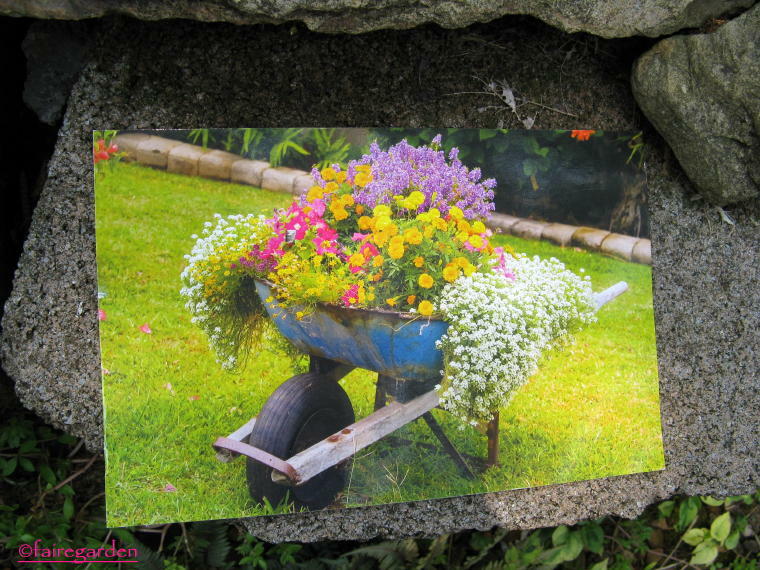 After a week in England in early May, the return found the wheelbarrow planter was zooming ahead towards the vision in the postcard. Photo taken May 12, 2010. Pleased with the progress, the new camera, Canon SX1 IS is brought out for those crazy perspective shots. The Butterfly Japanese maples in front of the entrance to the main house look like they are right behind the wheelbarrow instead of over one hundred feet away. Photo taken May 16, 2010. From the other side, Rosa ‘Fairy Queen’ looks to be right behind but is actually more than fifty feet up the hill. Photo taken May 24, 2010 with the SX1. 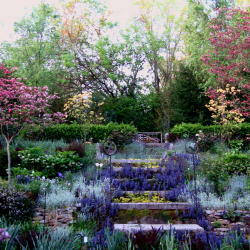 By May 26, the desired waterfall effect is beginning by the Calibrachoas and Alyssum, finally. Photo taken with boring old camera, Canon A720 IS. Close up of the Celosia taken June 2, 2010 as we prepare to go on the family beach vacation. 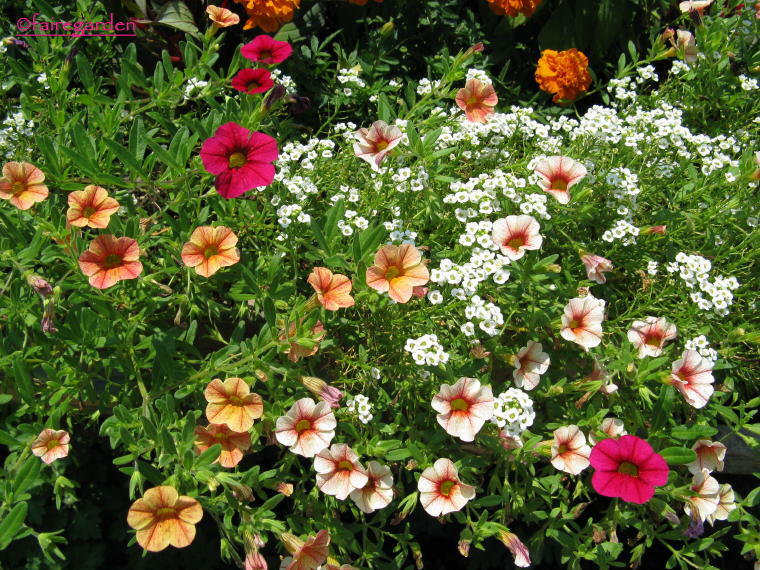 The plants selected are everyday annuals, nothing rare or exotic. There is a bright mix of colors with spikes of blue and red and blobs of orange. The spillers are weaving together around the edges on June 2, 2010. The weather is heating up and there has been no rain for a while. There was slight worry about that during the beach holiday. But that worry was needless for upon returning home, little has changed in the wheelbarrow. It is dry, quite dry as is the entire garden for little rain fell in our absence. A good long drink perked up the plants though. Photo taken June 22, 2010. So here is the inspiration next to the finished product. Not quite the same, but with the same kind of vibe. Alyssum in our climate is fried by June so cannot be the main spiller. I prefer the blue Salvia to the purple Angelonia for the thriller. 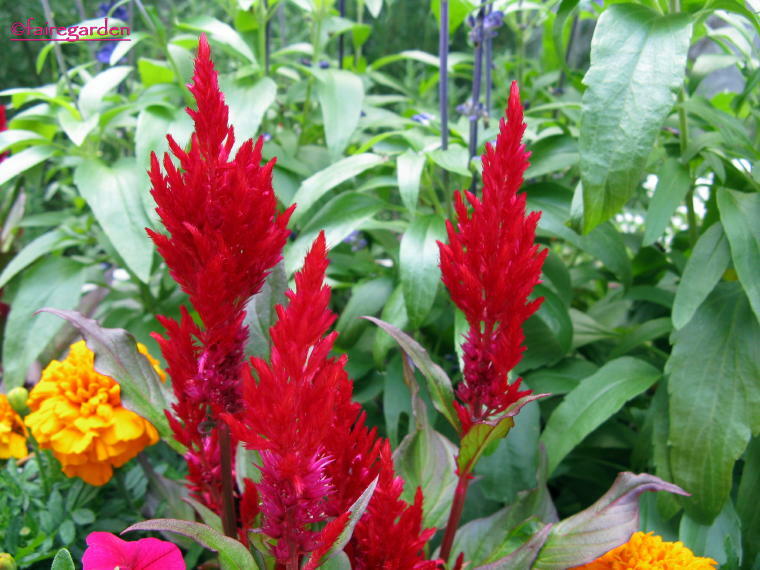 We should have used more Marigolds for the fillers but couldn’t resist the red Celosia. To be honest, this is way sooner than the planned big reveal of this project but something happened that we wanted to share and couldn’t wait to tell you about a little guest. We went out early in the morning with the camera, well before sunrise, because we have a daylily that is reported to stay open during the night, H. ‘Moondazzle’, and a night shot was attempted. That was a flop, but while we were out, we remembered that the marigolds in the wheelbarrow needed deadheading. Such luck that the camera was in hand, for a dark spot on the quarter sized orange flower that was at first thought to be a slug or insect of some kind turned out to be an itsy bitsy toad tree frog? (thanks Lisa). The flash from the first shot scared him and he was walking away as I fumbled with the macro setting and just barely captured his image. It could be said that he was was gone in a flash. 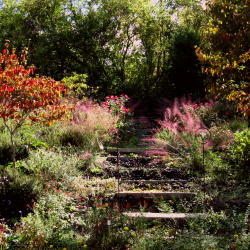 This entry was posted in before and after, Projects, wildlife. Bookmark the permalink. I love the wheelbarrel garden. LOVE it! I’m gonna keep my eye out for a broken down one. Hmm, maybe I’ll blog that I’m looking for one and see what happens. 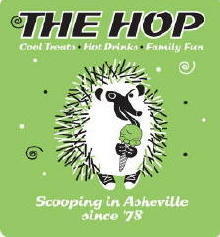 The mini hopper is precious. Hi Jen, thanks and welcome. 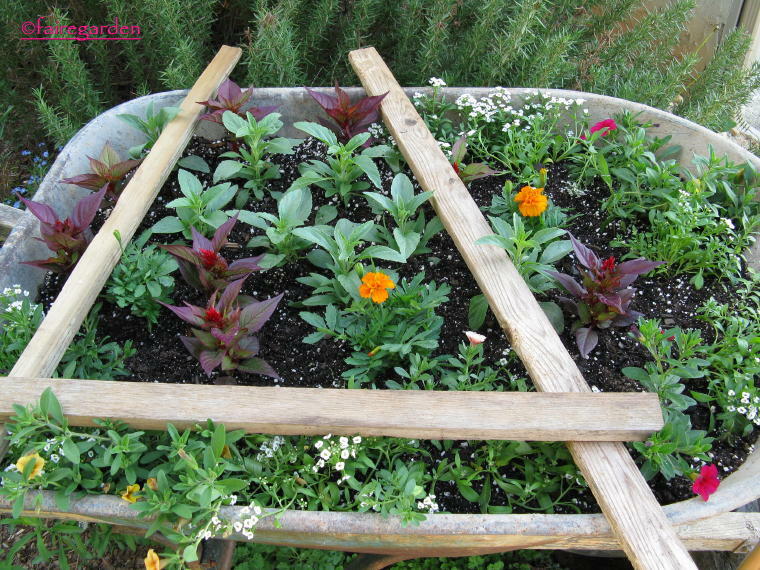 Old wheelbarrows make perfect planters. The size and depth give plenty of root room for the plants. We have another one filled with sedums that was found on the property when we moved here, very low maintenance. This blue one will be filled with seasonal annuals, making a nice entrance into the gardens. Oh Frances, I think your version of the wheelbarrow planting is prettier than the one on the post card. Well done. There is something to say about those old fashioned annuals. They aren’t picky about the watering the receive and they bloom admirably. I love the vibrant colors too. I don’t think this frog is a toad. I think it might be a tree frog. Whatever it is a cute little fellow/fellowette. What a great idea, I actually said to Ian last weekend that we needed a new wheelbarrow, there are now a couple of holes in the metal bottom! Well, this whole post was just great. 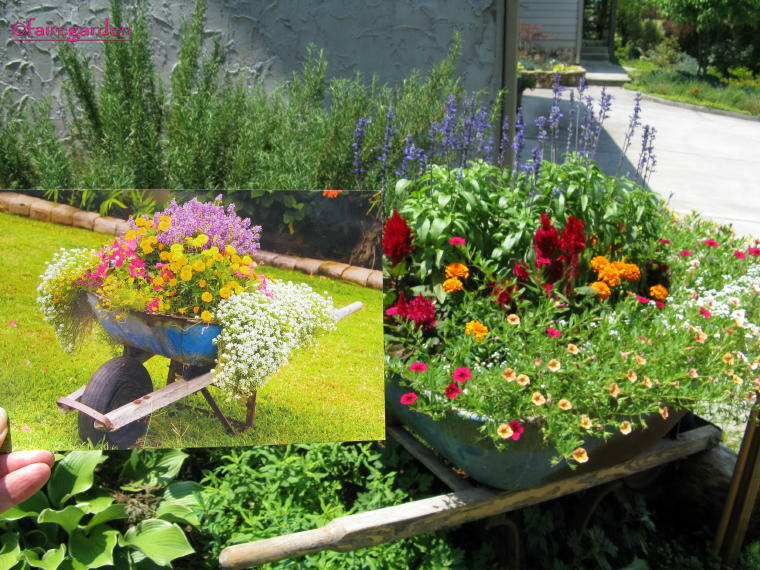 I love the wheelbarrow, and I personally think that your version is more pleasing, at least to my eye. Actually, what your post shows is that you will get a great little bit of eye candy if you just go buy the things you like and plant them in a good arrangement. The little toad really is the highlight of this post for me, though, I’m afraid. This is probably because I just love my bug eaters, and truly enjoy the evidence that my ecosystem is healthy and functioning. Thanks Hands. The toad is the highlight for me as well. In the darkness, I did not realize what was on the flower until it moved when scared by the flash. He was barely one half inch long, if that. An early morning thrill to say the least. I have a wheelbarrow that is just about finished. It won’t stay upright but falls over when I pile soil into it. 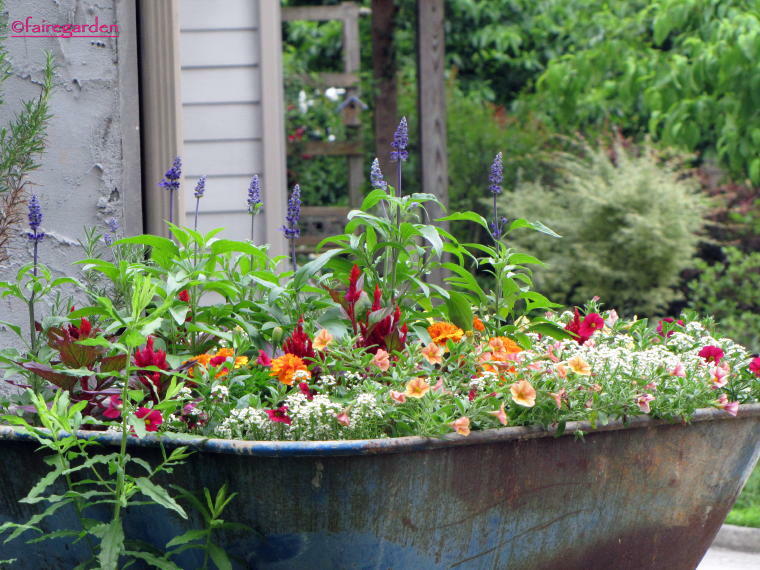 Your wheelbarrow idea may give this old wheelbarrow and new life as a planter. Thank you for the inspiration. Dear Frances, So colourful and so gay and, if one may be a tiny bit critical of another’s efforts, so much more attractive than the original source of inspiration. Something to be enjoyed all summer long! Your wheelbarrow is just beautiful. I love the celosias (and usually I hate them) along with the orange marigolds. I am trying to be more daring. I can also see that good potting soil is essential. I like the info about the wooden slats to keep cats out while the plantings take hold. Such a useful post. Thanks Pat. The mix of red and orange was risky, but we like it. Needs some yellow too. Next year. I asked Ruth at Mouse Creek what potting mix she used, thinking she probably made her own and she showed me the large bags of Fafard. Her planters are spectacular, with no additonal feeding, just regular water. Nearly every planting here of little things, baby plants or seeds requires chicken wire, stakes or something to keep critters out until the plants grow larger. There is still digging then but it is less damaging to the plants. 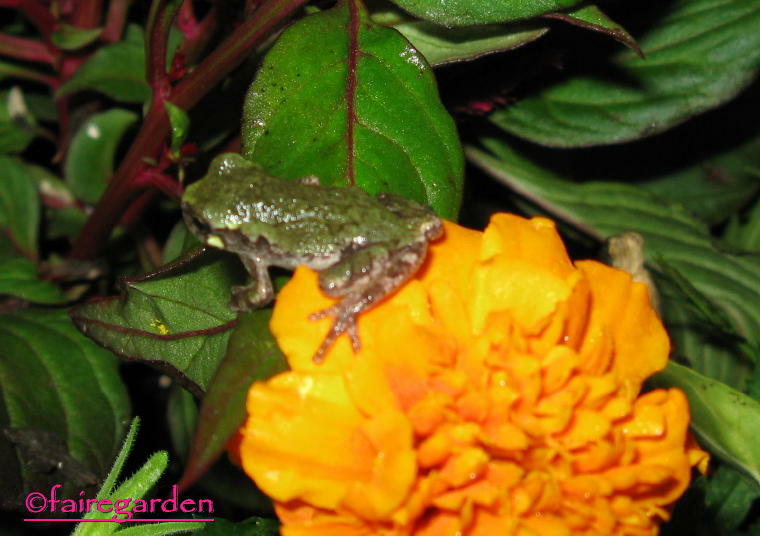 Glad you shared this little tree frog with us, Frances. Normally, we don’t have visitors like this, but our fields are full of ponds right now, so I can hear the lullabies of the frogs every night. That is very inspiring. I really like your version better than the postcard. I like your color/flower choices. Very pretty! Frances – I like your design better! I must ask — do you leave it in place, or have the urge to move it around the garden? 🙂 Hope we all get relief from the heat. 101 here today. Indoors for me. My poor garden has no a/c. Thanks Cameron. It is way to heavy to move and the tire is flat anyway. I like the position, right at the entrance by the garage to the back gardens anyway. Maybe some pansies and violas in the fall, bulbs? That heat is brutal. Do stay inside where it is more human friendly. I often wonder how the plants can stand it, but they are drooping here, even with my watering. We need rain, pronto! 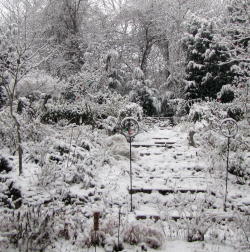 The wheelbarrow on the postcard says, Spring. Yours shouts Summer! Richer colors, summer fun. I love vacations, but love to come back to see what has grown and is blooming in my garden. 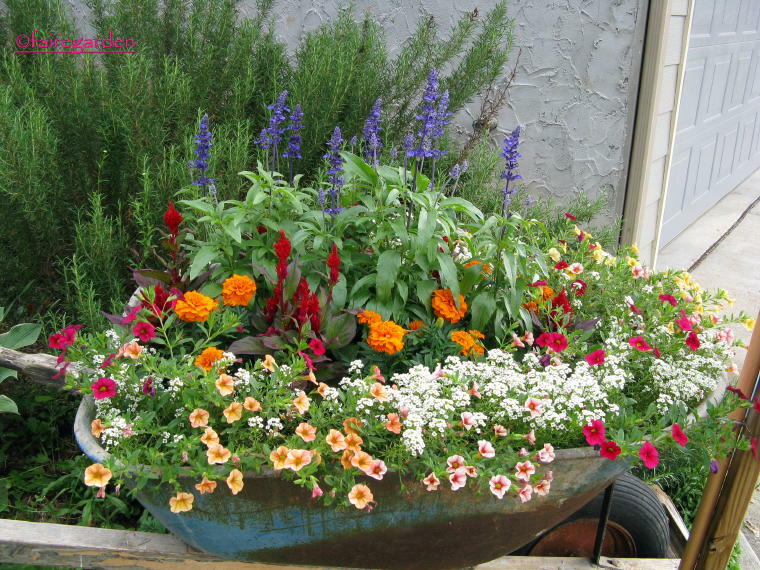 Your wheelbarrow full of pretty flowers is lovely. I also cannot do any heavy lifting, what a inconvenience it is to wait for help to arrive. Take care of your self. One of the best things about going on holiday is returning to home sweet home, I agree completely, Jennifer. Thanks for the kind words and sympathic ear. I am bad about not waiting and always pay for it later. I am sorry to hear you also suffer with it, and take care yourself as well. I agree – yours is better than the postcard! My sister had a wheelbarrow planting but unfortunately the dogs decided to dig in it. Wonder if the 1 x 2s would have helped? And what a great shot of the tree toad! We need rain pronto, too – over 100 degrees predicted today. Hi Ginny, thanks and welcome. How awful about your sister’s barrow. Hardware cloth or chicken wire might have worked better for that, the boards were just loose and would have been dislodged by larger animals. That is so hot, I hope for rain for both of us! 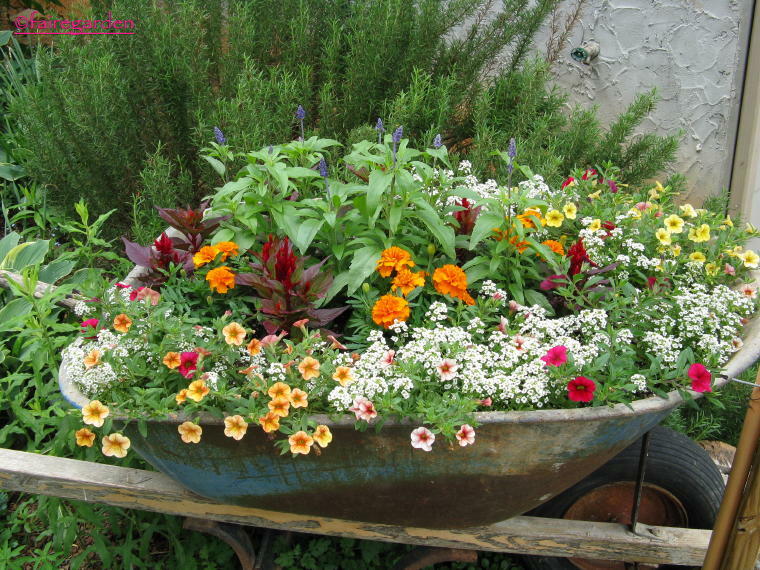 I love the wheelbarrow Frances – I have 2 mini ones with annuals growing just now but my spillers will be nasturtiums as I am trying to attract butterflies into the garden. I really like your spillers especially the colours of the “million bells” – not sure if you call them that or their big long name begining with I think a C that I can’t pronounce. I wonder what else does be in your garden at night that you’re unaware of! Great to get a little pic of your new fairegarden resident. I hereby grant myself the right to steal your wheelbarrow idea strictly for personal use in my garden. Thanks as usual for lovely , inspiring posts. Such a fun idea! I haven’t done much with annuals in the past few years since I’m sinking my whole budget into perennials and shrubs and trees, but eventually I’m going to get creative and do stuff like your project. 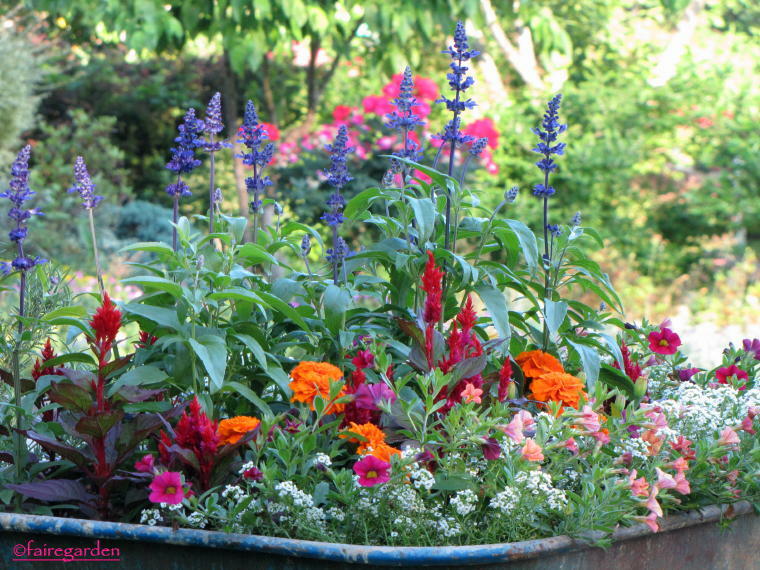 I love the Victoria salvia in the mix – I think that’s my favorite annual. Or in the top 5, at least. Lovely and brimful. He’s a tiny chap. 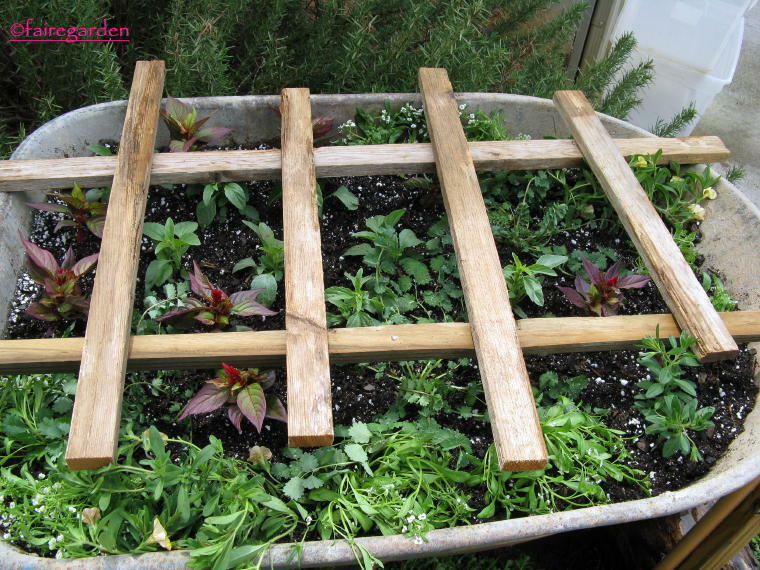 Your wheelbarrow garden is a barrel of fun! The colors just jump out and honestly, I prefer your spillers over the white alyssum on the postcard. We call little tree frogs peepers. We can hear them sing a summer song at night. Ohhhhh! What a sweet little critter.Love the new feature in your garden.I like it better than the postcard. Love it! So full and cheerful! Those tall blue exclamation marks are a very good touch! Frances, your wheelbarrow inspires me! I’ve got an old one out front that I painted purple. It’s begging for equally colorful plantings. When I return from Buffalo, I’ll get creative with it! Frances, always inspiring. I need to be on lookout for a wheelbarrow, have just the spot at the end of the patio. I haven’t been here before, but I will come again. What a beautiful blog! 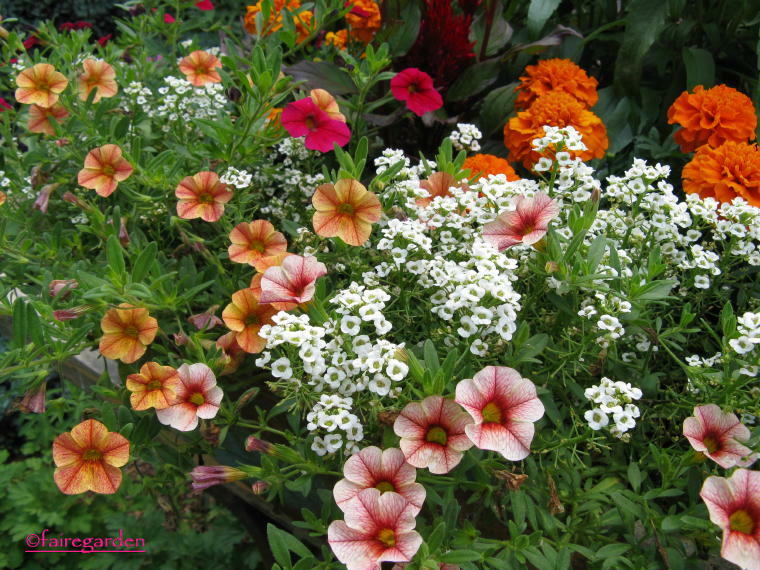 Your container gardens are stunning!